So, I was drinking a margarita and accidentally spilled it on my steak. Okay, not really. But that would make for a much more fun story. The truth is, I marinated the flank steak in tequila, lime juice and salt (plus a little garlic, cumin and red fresno/jalapeno), and margaritas were clearly my inspiration. The result is steak that is tender, juicy and citrusy. But I gotta tell you the 'papas' part of these tacos is secretly my favorite part. I make these potatoes all the time, usually for breakfast, and I just never seem to get tired of them. I only lightly brown them, so they're more soft than crispy and I always use Yukon Golds. Cutting them into a small dice seems to make the littlest of potatoes go a long way. This Yukon Gold was slightly larger than a lime and once diced it was more than enough for 2-3 tacos. 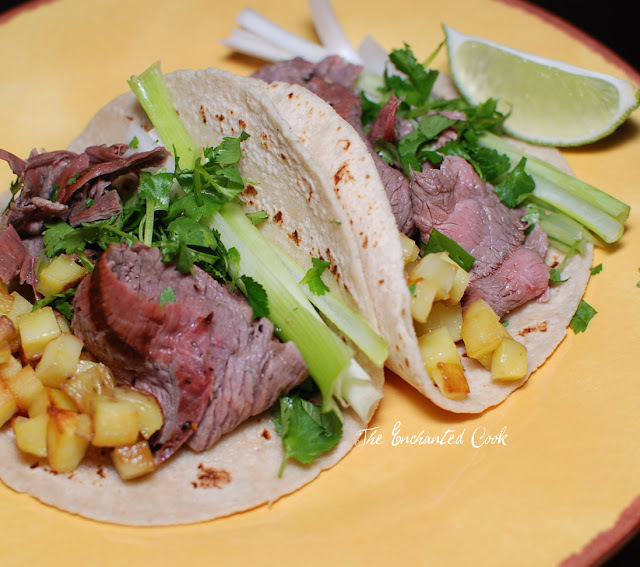 Back to the Margarita Tacos.. first you'll need to marinate the flank steak overnight or up to 24 hours in the refrigerator using the following marinade. Place all ingredients, except the tortillas, in a zip-top plastic bag, seal and turn to mix thoroughly. Store in refrigerator overnight or up to 24 hours. When ready to cook, heat indoor or outdoor grill to high heat, about 500 degrees F. Remove steak from marinade, discard marinade, and place steak on hot grill. Cook for about 3-4 minutes per side for medium. Adjust less or more based on thickness of your steak. Mine was about 1 inch thick. Remove from grill and allow to rest for a few minutes before slicing. Slice across the grain in thin slices. Season with extra salt and fresh cracked pepper if desired. 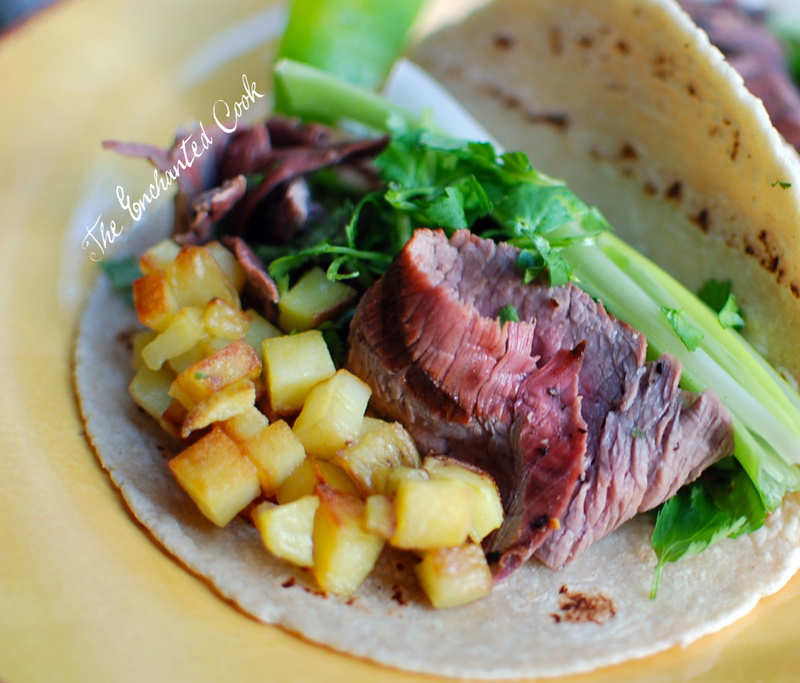 Serve on tortillas with your favorite toppings including the papas recipe below. Heat skillet to medium-high heat and add oil. Next add diced potatoes and a dash of salt. Cook for approximately 6-8 minutes stirring occasionally until potatoes are tender. If they start to brown too much, reduce heat to medium and continue cooking. Taste and add additional salt if desired. Add whatever toppings you like - this time I used cilantro, green onions, and lime juice. You could add cheddar cheese and sour cream, too, if you like. Oh my goodness!! these look unreal... the exact sort of tacos I LOVE! haha, dont worry... the potato part is my favorite too! Claire - I feel better now!! Kristie - You know it! Haha! Yumm, I had tacos last night, but they weren't as nice looking as these. I'm gonna add potatoes next time, I do love the yukon golds. A margarita sounds good too. Are you getting excited for the festival? Thanks for tonights dinner idea. I have steak sitting and was wondering what to do with it. Okay I guess it will be tomorrows dinner, I forgot I have to marinate. I've gotta try those potatoes! Yum! Oh this really rang my Taco bell!